If I had thought about it, I would have included a familiar object, such as a coin, for scale but the screw is 2” long with a ¾” diameter knurled head. With the milling complete, the job is parted off. A cruel enlargement but I hope that the machining marks disappear under the new owner’s paint job. I received a most gracious email from the delighted owner. See the video clip of the flycrank in action. Later, I was asked by another 0 gauge modeller to repair a fly crank. Some time later, I enquired of the fellow 0 gauge modeller as to how he was getting on with his Barclay 06 and he sent me some photographs but explained that he was stuck again for want of some thick buffer plates (as he called them, they would be called buffer planks on a steam loco). After a bit of to and fro re the details, I produced the items for him so now there's no excuse. 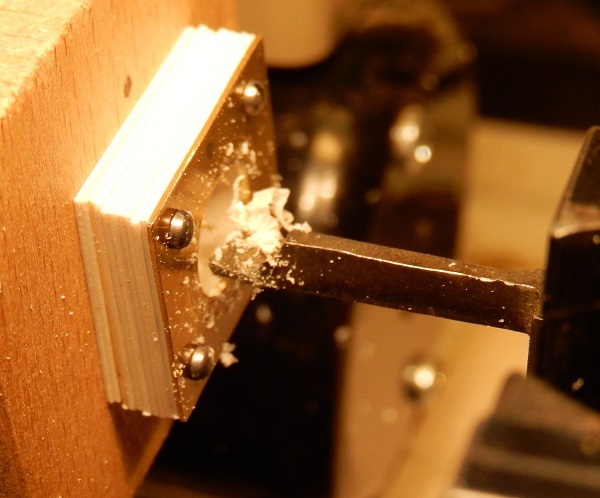 The final milling operation, making use of one of my recently acquired collets to hold the milling cutter. 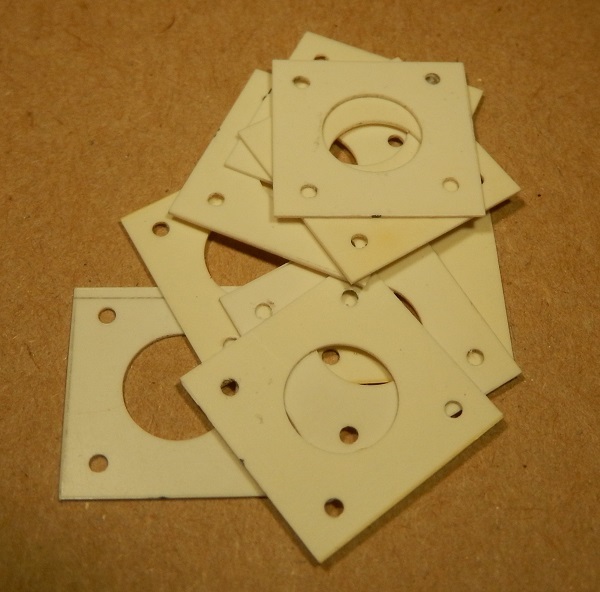 The finished items, which will be soldered behind the thin etched buffer plates that were supplied in the kit. The upper cut-outs allow these new plates to fit around the existing buffing and draw gear. Like most people, I receive unsolicited emails by the wagon load and most of them are spam or junk but I do occasionally (well, quite often sometimes) receive emails complimenting me on my models or asking a question about how I did something. They usually start off “I found you on the internet ..." One such arrived about ten days before Guildex 2012 at Telford asking if I knew a man who could turn down some wheels on his modern Bassett-Lowke Peckett 0-4-0ST “Joseph” and if they could hand them back at Telford. Couldn’t be that difficult, I thought, so I volunteered to have a go. Now it wouldn’t have been that difficult if the wheels had not been cast in stainless steel - and free-machining it was not! The day after the show, I received an email from the happy owner to say he had been up half the night refitting the wheels and then trying his new loco that now no longer knocked on the chairs of his Peco rail. A fellow modeller contacted me about a fly crank in which a steel screw had sheared off and I offered to see what I could do. 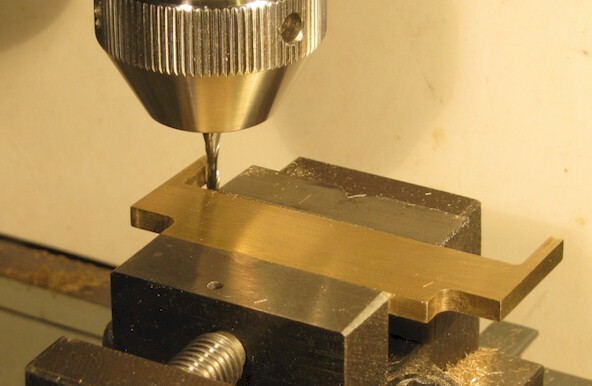 As it turned out, it was quite straight forward; I am not at all sure that I would have been successful if I had tried to do it by hand so I was glad to be able to help him out with my machine tools. The remains of the 12BA steel screw may just be seen in the ailing fly crank on the right; I believe that it sheared off whilst being screwed through the laminated fly crank. 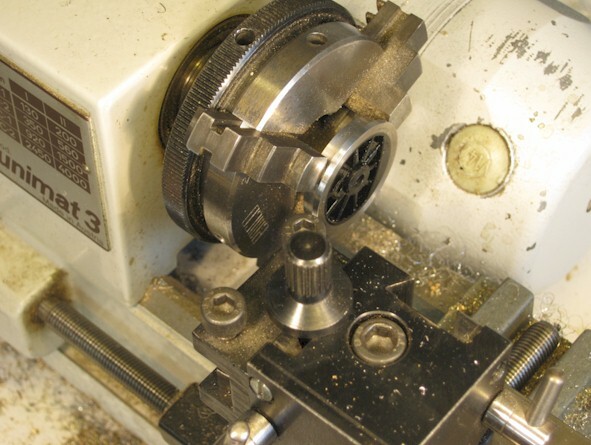 The first job was to set up the fly crank on the milling table to drill out the screw and then open up the hole to receive a suitable plug. The photograph shows the hole being opened up with a 2mm diameter slot drill. 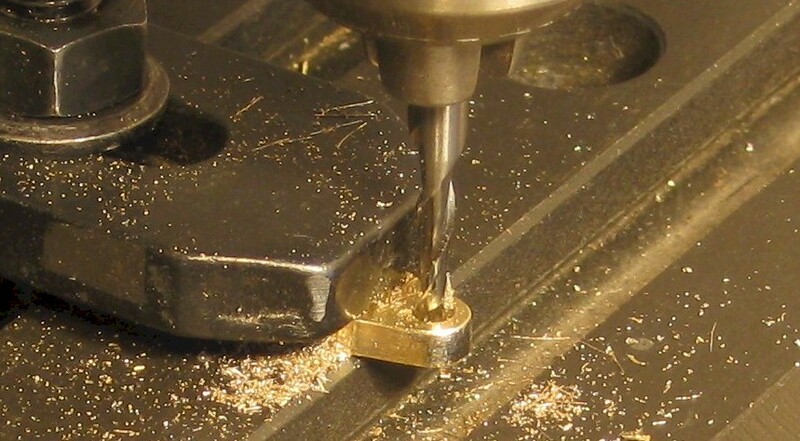 I machined up a brass plug that was a tight fit in the hole and pressed it in. On the left, the plug is part way there; on the right, the plug is home, having been riveted over into the lightly chamfered holes in the fly crank and then cleaned up. It’s not quite an ‘invisible mend’ but, then again, it doesn’t need to be. I measured the throw of the sound fly crank and it scaled out at 10”, which seemed plausible to me. 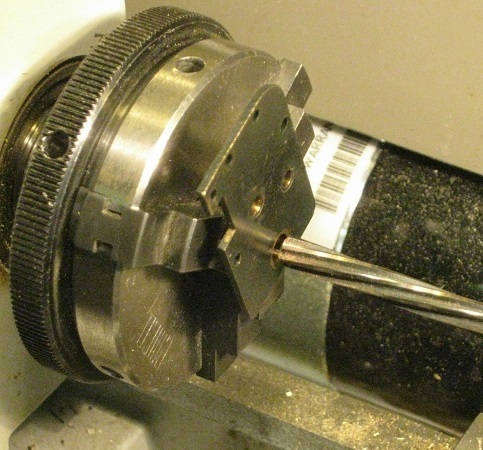 I machined up a mandrel with a small centre hole clearly visible so that I could set up the assembly in the milling machine and offset from the centre by 5.83mm to drill the crank pin hole at the specified throw. The photograph show the centre drill (aka a Slocombe drill) being withdrawn from the new centre. 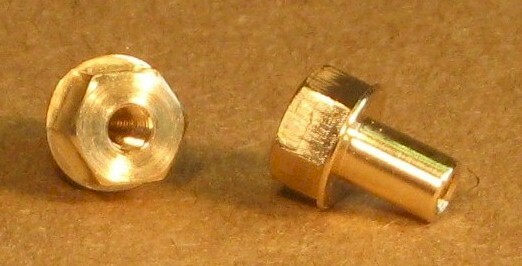 All that remained was to drill tapping size (1.1mm) and to tap 12BA, and the job was done, as shown on the right of the photograph. Fellow modeller was delighted, which is very rewarding, as he feared that the fly crank was a ‘write-off’. 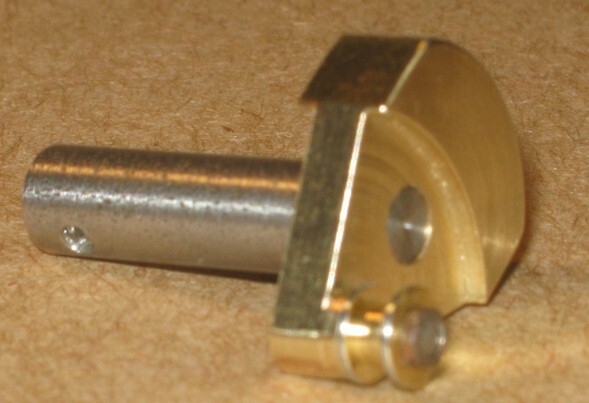 On the Gauge 0 Guild forum a modeller enquired after a source of steel top hat bearings, preferably with two small holes diametrically opposite for tightening, but to no avail. I offered to make him a set, along with a suitable peg spanner to tighten them with; I could have made the bearings from stainless steel but we agreed that I could make them from brass but that I would tin the visible parts with solder and then wipe before it had set. My own top hat bushes are tapped for 12BA, and the 0.65mm diameter holes are on nominal 2mm centres; the pins in the spanner are 0.5mm diameter piano wire. However, I did not actually measure the hole separation when I made these bushes as the modeller wanted his bushes tapped 10BA, so I just drilled the holes in ‘what looked like the right place’ and then made his spanner to suit. To drill the tightening holes in the bushes, I put an under-cut 10BA thread on the turned down end of the bit of steel that was to become the spanner. I mounted this vertically on the dividing attachment in the Unimat miller, and then screwed on the first bush (carefully nipping it up with pliers with masking tape in the jaws). 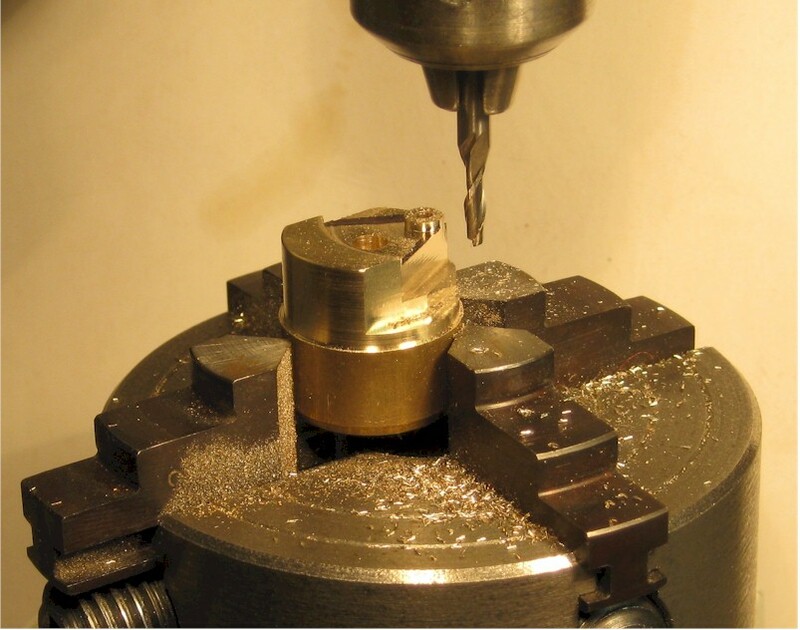 With a centre drill in the spindle chuck, I moved the milling table until the drill was in what I appeared to me to be in the middle of the rim (ie halfway between the tapped hole and the edge), I then locked the milling table and drilled the centre and followed it with the 0.65mm drill. 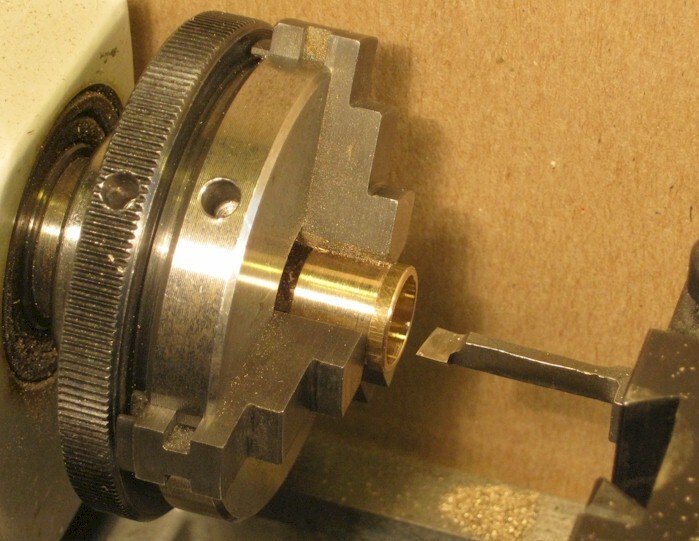 Turning the dividing head through 180 degrees, allowed me to centre and drill the second hole. When I had drilled all twelve holes in the six bushes, I carefully sawed off the threaded shoulder by hand and then centred and drilled 0.5mm for the steel pins. In this manner, the spanner will match the bushes, even though it is not to my 'standard' nor was it measured. 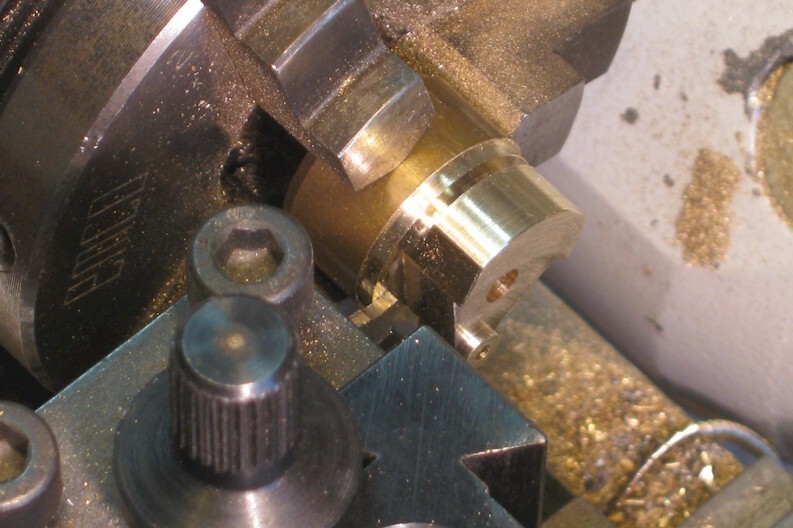 I then removed the collet to the Unimat lathe, faced off the end of the emerging spanner (to clean up the rough saw cut) and drilled a deep central hole a generous clearance for 10BA to allow space for the potentially temporarily over-long 10BA crank pin screws. The piano wire that I use is slightly up on 0.5mm so a press fit is all that was required but a drop of Loctite would have seen to it otherwise. 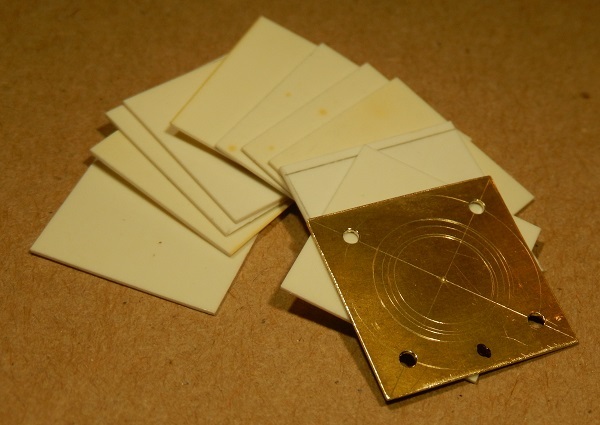 The 0.65 mm holes may seem a bit generous on 0.5mm pins but there is no particular virtue in a precision fit here, whereas pins that will not easily enter, or are tight to enter, would be quite a nuisance. A fellow 0 gauge modeller asked me if I could make some top hat reach nuts to attach the new chassis that he had made to a body of a second hand JM Jinty. He needed the reach nuts because the 8 BA stud attached to the body only just came proud of the chassis spacer hence the need for a top hat to give the extra reach rather than a plain 8BA nut which only had a quarter turn purchase. I know the problem well but it was easily sorted with some happy time spent playing with the handles on the lathe and milling machine. I put some flats on the brim of the top hat to give it a 6BA head but I left part of the brim as a integral washer. I was pleased with them and fellow modeller was most grateful; he said “They look like little bits of jewellery. Not only that, but they do exactly what I wanted them for” so smiles all round. Actually, my wife has commented that some of the parts that I make look like jewellery but that it's a shame that you cannot see most of them, or that I paint over them. I have offered to make her jewellery for her, instead of buying it, but so far there's been no take up! I helped a friend with a Class 40, which is to be part of an imaginative diorama of the Great Train Robbery that will be on show for the first time at Guildex in Telford this year (September 7th and 8th, 2013). One of its main features is a slowly rotating roof fan but the problem that my friend had come up against was that the fan refused to rotate, due to the rather large and poor bearing provided, and a motor-gearbox combination that was less than satisfactory. He also commented that, although he had been quite careful to drill the hole centrally in the lower fan boss, the fan and the upper boss appeared to be running eccentrically. I decided to tackle the eccentricity problem first. 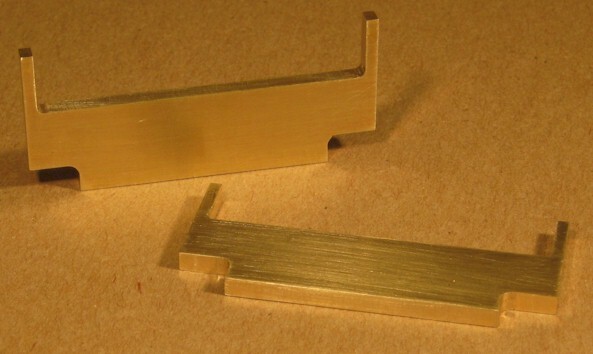 Unfortunately, the upper boss is 10.5mm in diameter so it’s just too large to fit in my collets so I machined a brass split-bush to suite (below). With the upper part of the fan boss nipped up in the split-bush in the three-jaw chuck, it was a simple matter to turn the lower boss true (below left) and to use a 3mm diameter slot drill to bore a concentric hole (below right). The gearbox was a flimsy second-hand affair that was not intended for this application so, as well as no way of attaching the motor, there was no way of attaching the assembly to the roof. I made a clamp for the motor, stiffened the motor plate and made a circular plate for attaching the whole to the roof (below). I made a bush to Loctite onto the motor shaft to take the worm and I opened up the bearings in the gearbox to 1/8” to suit the worm wheel and new fan shaft, that was turned down at the end to be a moderately tight push fit in the resin fan casting. Although the upper boss ran true, it was slightly oval and a bit on the heavy side so I gently trued it up and thinned it down, using the fan shaft as mandrel to hold it. I met a modeller through the Gauge 0 Guild who had sheared off the 12BA crankpin screws in a set of Slater’s driving wheels whilst he was attempting to remove the nuts that retain the coupling rods. Understandably, he wished to avoid buying another three sets of wheels and axles (at £60 in 2013) but they were not useable as they were. 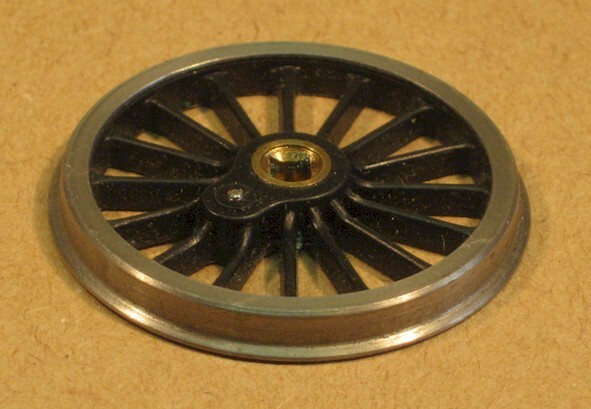 The photo of a wheel illustrates the problem. As you may see, there is a little stub of the sheared off 12BA screw where there should be a nice clean hole and the screw is glued in with super-glue so there is no chance of shifting it by unscrewing. File flat the broken end of screw and mount the wheel on an axle in a drill chuck that is clamped to the milling table (but could be a drilling table). Using the X and Y handles, adjust the table until the screw is centred under a small centre drill and lock the table. Drill a centre. Follow up with a pilot drill (I used 0.7mm) and drill right through the screw. 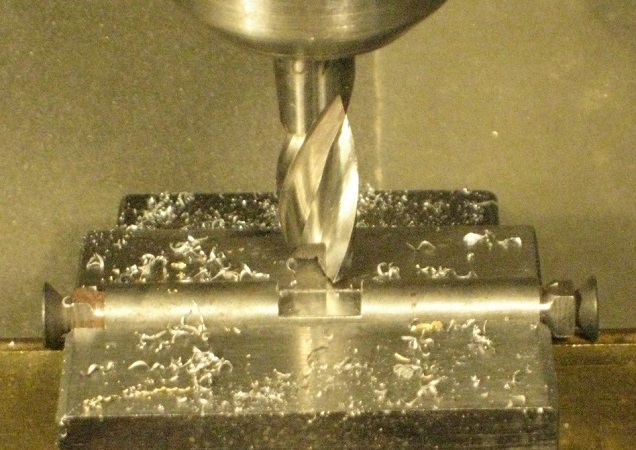 Follow the pilot drill with a 1mm slot drill or end mill; I had one with a pointed end which I believe helped to keep it centred in the pilot hole. Drill right through. Turn the wheel over and, with a 2.5mm drill, drill out the remaining 12BA screw head and create a counter bore for the new one. One done, five more to go. Once the first wheel is set up, the remainder are registered correctly when they are mounted on the axle. I could have omitted the operations with the centre drill and the 0.7mm pilot drill and gone straight in with the slot drill. However, a pilot hole seemed a safer way to me. It is a bit trying on the nerves but it’s a relatively straight forward operation and it was well worth the time and effort invested, given the cost of replacement wheels. I have suggested to the modeller that, when he puts his chassis back together again, he uses varnish to lock the nuts in place rather than super-glue so that they may be removed if need be. The final photo (on the right) shows one of the bespoke crankpin bushes and spacers that I made for the wheels. 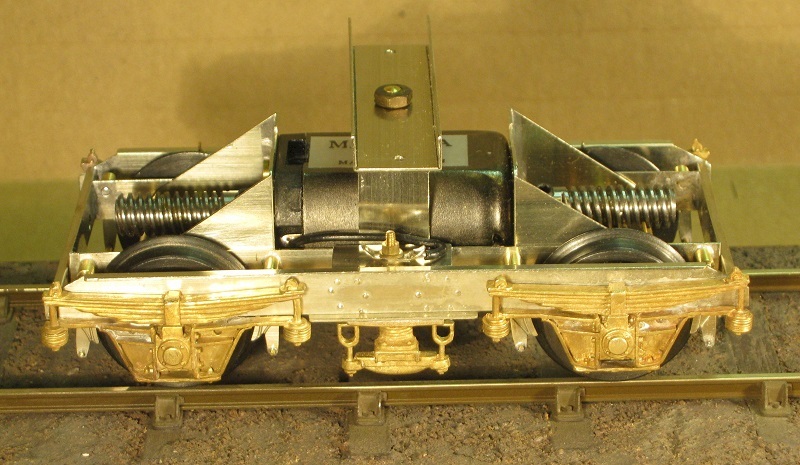 See the expanded version: Some ideas and suggestions for assembling these powered and non-powered 7mm scale Westdale DMU bogie kits. A fellow modeller asked me if I could help out with the motor bogie for a Class 121/2 ‘Bubblecar’ that he was building from a kit by Westdale Coaches. Looking at the components I could see that they were potentially a useful kit of parts but I could also see why my friend had got into difficulties: the instructions give only an outline idea of how to go about assembly and the etches had some errors: the holes in the motor mounting plates and bearing holes in the inner frame required quite some ‘drifting over’, and the lap joints to make up the inner frame were not quite in the correct place on the etches so they needed adjusting to achieve a square frame. To the left are all the subassemblies (except the brake rigging) that are assembled by springing together, for the most part. In the middle right, is the Mashima ‘double-ended’ motor and twin gearbox assembly, complete with the two worms on the ends of motor shaft. 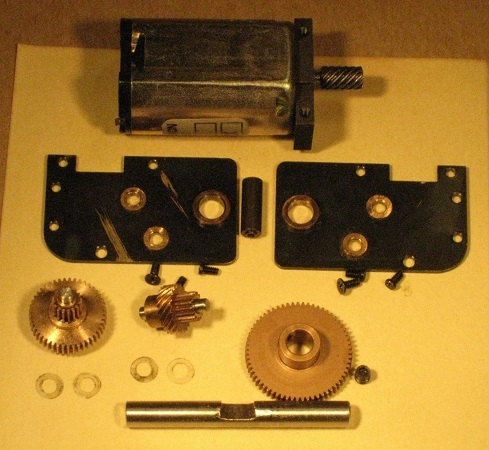 The inner frame (in the front of the image above) is clipped to the motor/gearbox assembly by springing it over the bearing bushes that project from the gearboxes. The lower bolster (inverted U-shaped bracket with projecting brass pins) is sprung into position between the motor and the inner frames. The phosphor bronze wiper pick-ups on the ‘insulated’ side are soldered to a piece of copper-clad with an insulation break so that it could also be soldered to the inner frame. A 12BA screw, two solder tags (one for the wire to the motor, the other for a wire to the unpowered bogie) and a nut complete the pick-up assembly. Next the axles, worm wheels and wheels were assembled (left), ensuring that both of the insulated wheels were screwed onto the axles on the same side as the insulated pick-up assembly. To retain the axles and the worm wheels centrally, I made up two pairs of spacers to go between the worm wheels and the inner frames. The pickups on the non-insulated side are soldered to a piece of nickel silver that is also soldered to the inner frame. 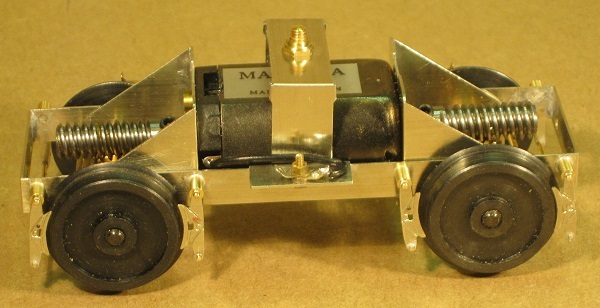 The instructions suggest using 0.7mm diameter brass wire to locate the brake hangers on the inner frame but it would not be possible for the wire to cross the frame, as is a common practice, as the motor/gearboxes would be in the way of the inner two wires. I turned up eight brass posts with spigots on each end; one spigot locates the post whilst it is soldered into the inner frame and the other is for the top of the brake hanger to clip over. The brake rigging was made up in situ as two assemblies using the eight etches of brake hanger/blocks, brass wire as cross-rods and brass strip to join each pair of cross-rods so that each assembly is rigid and may be clipped over the posts. 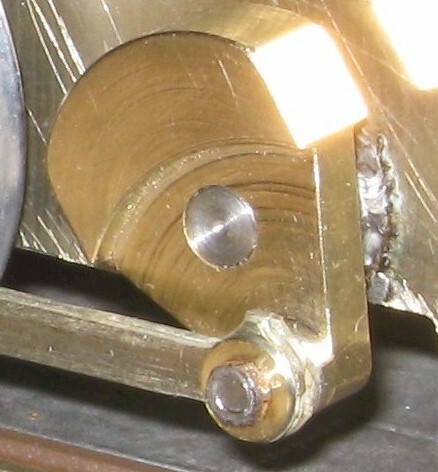 To complete the bogie (right) the outer frame is sprung into position over the inner frame and retained by a pair of short pins in each end stretcher of the outer frame. The kit includes 8BA screws, washers and nut to unite the two frames but the springing into position seemed a less obtrusive but easy solution to me. The upper bolster, which is to be attached to the floor of the coach, is retained with a 6BA half-nut on a shouldered pin in the lower bolster. The second set of pick-ups for the unpowered bogie lie in the front of the completed bogie. 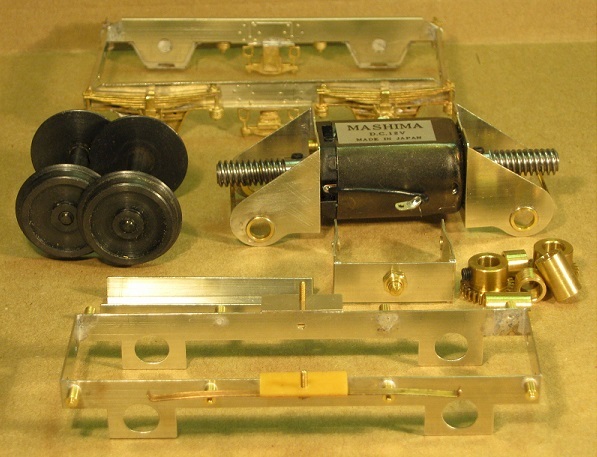 See the expanded version of the above: Some ideas and suggestions for assembling these powered and non-powered 7mm scale Westdale DMU bogie kits. An 0 gauge modeller asked me for help to open out the final drive gear and the axle bearings of several gearboxes from 4.50mm to 3/16" (4.76mm) diameter so that they would be suitable for use with Slater's 3/16" axles. 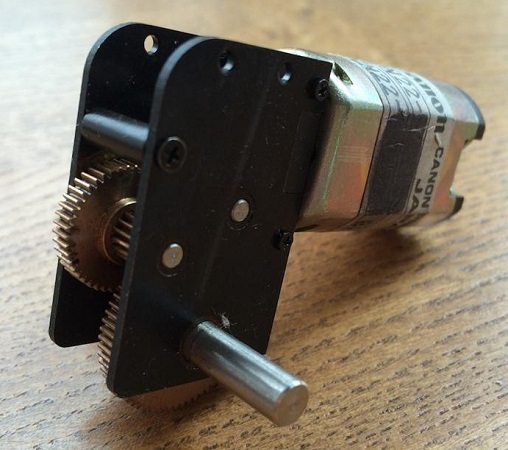 The gearboxes were not screwed tightly to the motors and the lower of the two screws could not be reached with the gearbox assembled and in place. The only way to reach the lower screws to tighten them is to dismantle the gearboxes. The bearings are made of a tough phosphor-bronze and, even with a new reamer, the torque was sufficient to rotate the bearings in the side frames so the bearings needed to be held independently of the side frames. 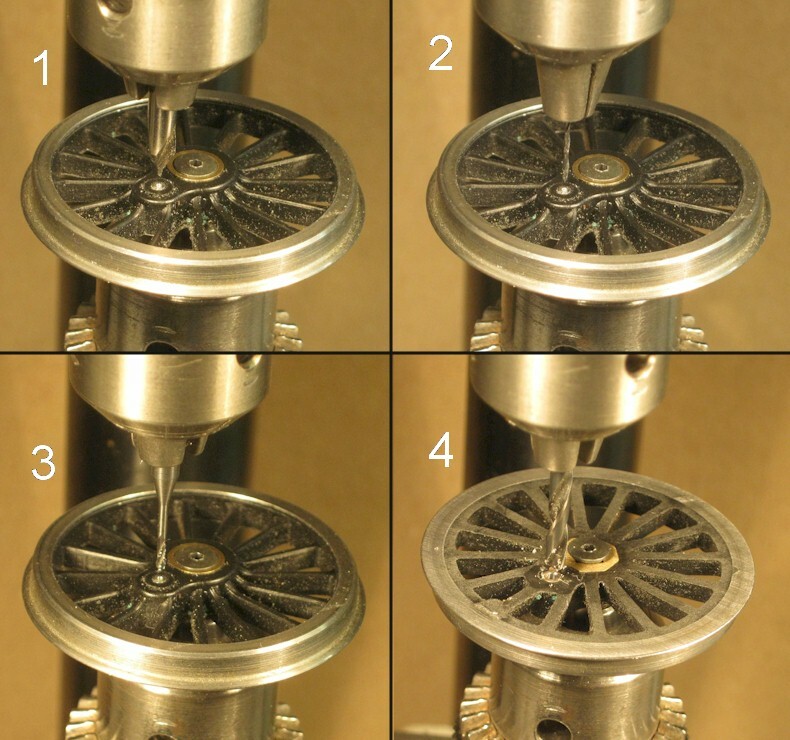 Even taking the greatest of care, there is a danger that swarf may enter the gearbox. A complete motor/gearbox (left) and with the axle, final drive gear and one side frame removed (right); a replacement Slater’s S7 axle lies in front. With the frames removed from the gearbox, the brim of the top hat bush may be held in a three-jaw chuck for reaming and chamfering. Ideally, I would have used a collet but the brim of the bush was too shallow for the collet to reach beyond its holder to grip it. There was no such difficulty with the jaws of the three-jaw chuck, which was sufficiently self-centring for this purpose. James May: The Reassembler? A gearbox stripped down with one of the 4.5mm stainless steel axles; note the milled 'flat' for the retaining grub screw, more of a notch than a flat. I milled similar notches in the mild steel Slater's axles. I would like to make it clear that these motor/gearboxes were old stock from FineScaleBrass and that the current motor/gearboxes, which are advertised on their website and which are available at shows, will have 3/16" axles and were made specifically for the 0 gauge market, so there would be no need to worry about this exercise. These shunters poles are not just 'magnets on a stick', the disc magnet is set its full thickness within a steel cup, so the magnet is effectively surrounded except for the exposed magnetic pole on one face. The cup brings the magnetic pole at the torch end round to be with the other pole at the business end, keeping the magnetic flux where it is needed, so it doesn't take on a mind of its own and grab a buffer, draw hook or anything else. It also concentrates the flux to make the small magnet effectively more powerful. When a friend said that he found that the bare magnet on his shunter's pole would indiscriminately grab other steel things, a ferrous shield, or pole piece, seemed an obvious solution to me, so I offered to make one for him for the next time we met. The modified pole was deemed a great success so we made some more to give to friends and we mentioned it to others, who commented favourably and asked if they could also have one, or more ... After my friend and I had made a good number, we both agreed that we'd rather spend our time on our railway and workshop, respectively, rather than packing up and posting off poles . 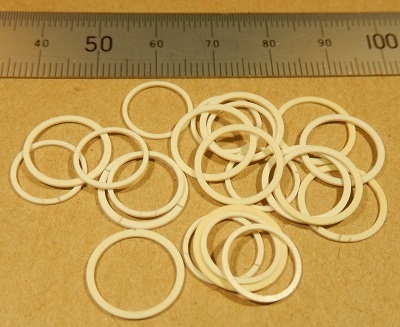 A fellow ) gauge modeller asked about a circle cutter to make thin plastic annuli for architectural details. It seemed to me that a silhouette cutter was the ideal machine for the job; I don’t have one but I offered to make some annuli on my lathe. ... that I could clamp and drill so that I could screw them to a wooden block to hold them in a four-jaw chuck. ... to complete the first stage. To machine the outside diameter, I made a mandrel to fit the inner diameter. A screw and recessed spacer clamped the blanks tightly together against a shoulder on the mandrel whilst the blanks are turned to size. For the larger annuli, I was able to reuse the brass cover plate and wooden block but I had to make a larger mandrel and recessed spacer. A friend sent me "a 'poorly' Gauge 1 14xx" saying "The main gear is turning on the axle, I am hoping you can pin through the teeth into the axle ..."
Hmm. I could see the merit in working on the gear in situ and not having to disturb the press-fitted driving wheels and ball bearings but I was not so confident about being able to hold the gear and the axle sufficiently rigidly and I did not really fancy trying to drill down between two teeth without damaging one of them. When the loco arrived (gosh, isn't gauge 1 lovely and big! ), I could see that the final drive gear had no boss, which is why my friend had suggested fitting a pin between two teeth. Looking at the job, the final drive gear was made of tough phosphor bronze and the axle of tough stainless steel (I know, I've worked on similar 7mm models before); both materials require a fair bit of courage to keep the drill cutting, otherwise the material work-hardens and restarting the cut becomes even more nerve-wracking. 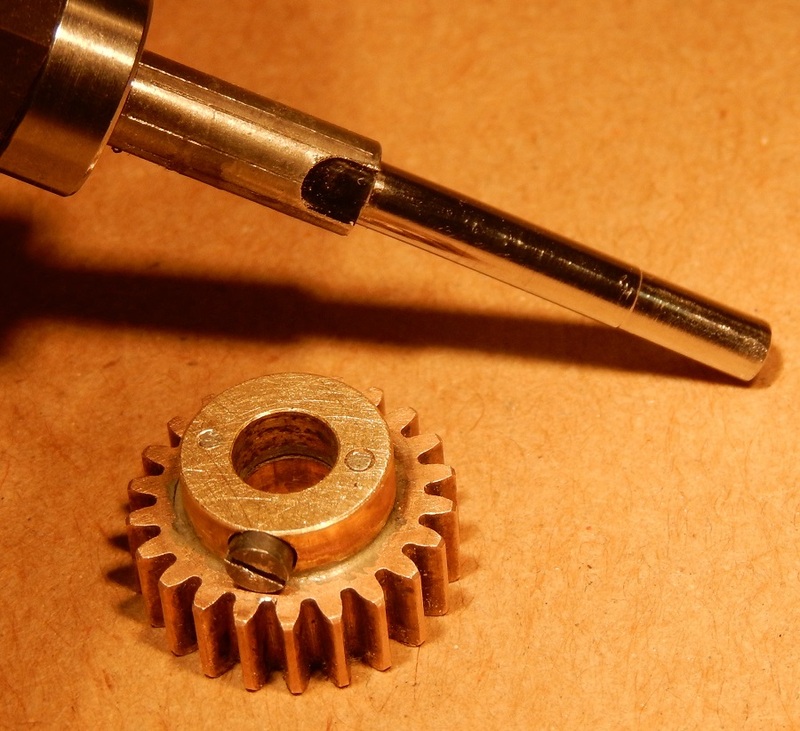 I might have attempted it if I could have held onto the gear securely but there was no way that I could; even then, the pin would have to have been 0.4mm or less in diameter and that would be a long way to drill such a small hole through tough materials, and there was always the risk of damaging two teeth. My Plan B was to remove one driving wheel from the axle (easy enough as there is no insulation at the hub) and one ball bearing (much easier said than done). 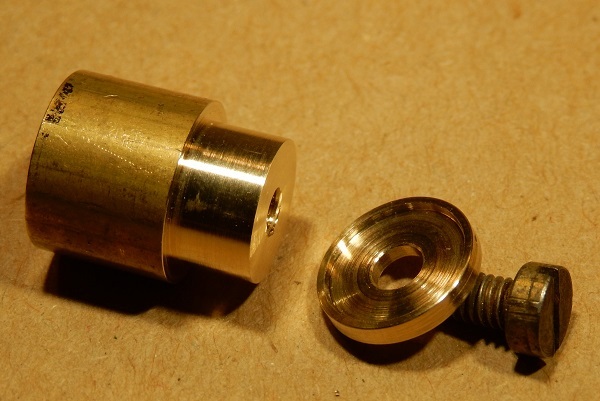 I made a brass boss that I drilled and tapped for a 10BA set screw and then I soldered and pinned it to the final drive gear (left). Putting a suitable flat on the axle and was light relief. I originally prepared these write-ups for a Gauge 0 Guild forum topic 'In the DLOS Workshop'.